Lateral thinking and a unique set of problems has meant the return to aviation for one Wairarapa farmer, as Clive Wilkinson found out. Having flown aircraft for the last 35 years, and built them for 30 of those years, Stuart Tantrum is one of New Zealand's foremost experts on wood and fabric aircraft. Now heading Antique Aeroworks, based out of Omaka Aerodrome, Tantrum's passion for such aircraft has become his life's work, as Max Pudney recently found out. The maiden flight of any aircraft is a momentous occasion, and one that requires skill, discipline and comprehensive understanding of the aircraft. 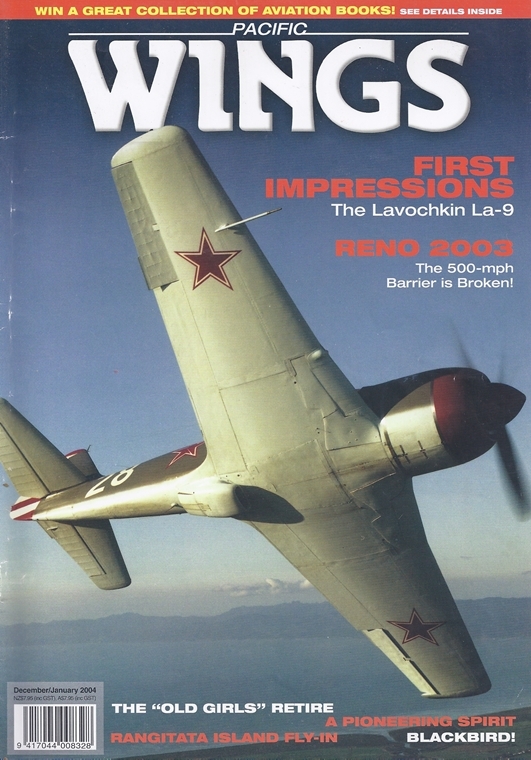 The Lavochkin La-9K-LIX took to the air from Ardmore in early 2003 and pilot John Lamont describes what it was like. When it comes to speed, altitude and secrecy, nothing comes close to the SR-71 Blackbird. With the era of passenger supersonic flights at an end, Alan Reynolds looks back on a remarkable aircraft that conducted its trade behind closed doors. For more than 20 years the two Boeing 727s, NZ7271 and NZ7272, gave faithful service to the RNZAF, transporting princes and paupers, materiel and medicine. Peter Clark was aboard the last RNZAF 727 flight and takes a brief look at the RNZAF's only tri-engined type. Reno 2003 - the 500-mph Barrier is Broken! With Mustangs, Bearcats and Sea Furys clocking 500-mph laps a few hundred feet off the ground, the National Championship Air Races at Reno are nothing short of spectacular. Doug Moulin reports from this year's races.